Apple Mac is the Best Operating System in World and has one of the best User Interface. Mac OS X Theme is a Mac Style Visual theme that can make your Windows look like an Apple computer. 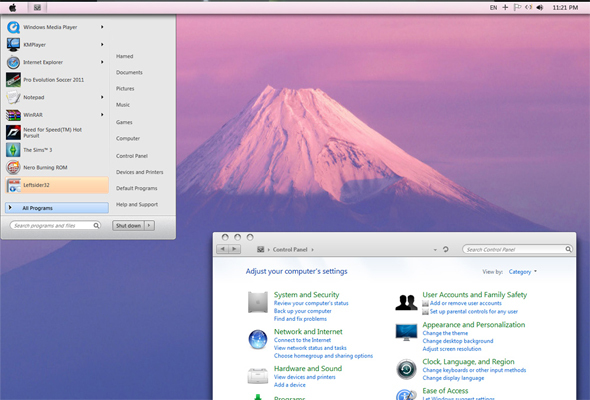 Using Mac OS X Theme you will experience best Graphics features and it’s better than Windows 7. STEP1 :- Download CustoPack Tool and Install it on Windows 7. STEP2 :- Download Mac OS X Lion Theme and Run it. STEP3 :- Once Both Packages are Installed on Windows 7, Restart your System. NOTE :- To Uninstall this Mac OS X Theme, Go to Control Panel and remove CustoPack Tool.